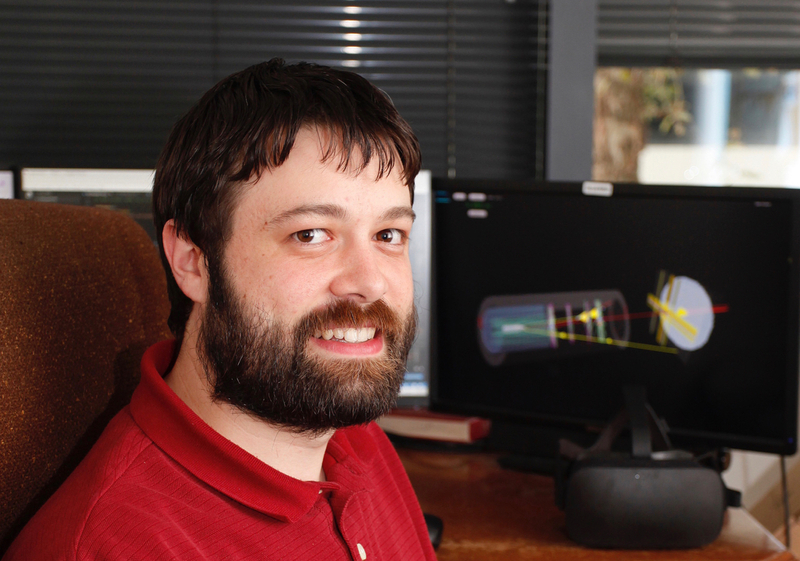 While it may be tempting to identify Britton as a computer scientist, he is actually a physicist who is currently working on the Gluonic Excitations Experiment in Jefferson Lab’s Experimental Hall D as a postdoctoral fellow. In fact, his degrees from Coe College are in physics and mathematics; computer science was just his minor. It is not until one reviews his dissertation from the Syracuse University physics Ph.D. program that it is possible to see hints of his computer science interest; his dissertation was on the Amplitude Analysis of B→J/ψφK (the analysis is where the computer science comes in). For GlueX, Britton created an automated system called MCWrapper, which he describes as the “definitive framework for GlueX Monte Carlo simulations.” Physicists use Monte Carlo simulations to make predictions. Monte Carlo may be used to predict what particles will be produced in an experiment or may be used to model how a real detector system functions in different scenarios. Britton’s MCWrapper system allows researchers to carry out Monte Carlo simulations on any number of different computer systems without the need to customize the configuration for each different system. It’s a kind of plug-and-play Monte Carlo simulator that is pre-configured for all things GlueX. In short, Britton’s technology essentially manages, runs and tracks the production of simulations for the entire experiment. To make it easier, he created an automated system that takes requests from an online application and handles the processing (mainly on the Open Science Grid). This enables researchers to better utilize available computation resources with ease. Part of Britton’s motivation for developing technology solutions is that he values the contribution he can make to a team. “My driving force is building the tools and systems that not only make my research easier to do, but that also help others,” he said. As he develops his interfaces, he keeps his users’ experiences in mind. Most of Britton’s users are other physicists, he says. It’s not just scientists who benefit from Britton’s tools; Britton designed a user experience for the lab’s most recent biennial open house, which welcomed 6,000 visitors who were interested in learning more about the groundbreaking research happening inside. During Britton’s demonstration, guests donned virtual reality goggles and were taken on a ride aboard a rendition of a subatomic particle as it traveled through the detectors in Hall D. Britton volunteered at the event to ensure that the technology ran smoothly throughout the day. He keeps himself busy with developing applications and technologies as well as his own research; with all the feature requests his fellow researchers have made, he still jokes that he should invite his colleagues to leave sticky notes on his door with requests so that when he feels like taking on a new project, he can simply go to his door and pick one. Outside of work, he spends time with his young son, Declan. In fact, the story of his family coincides with his time with GlueX. When he finds the time, he also enjoys playing games, both video and board; his son now joins in by helping roll dice.